Mobile 5D Cinema is a source of amusement, for a wide range of audiences – from children to young people to adults. Our 5D sessions are great fun for everyone and guarantee an unforgettable experience. 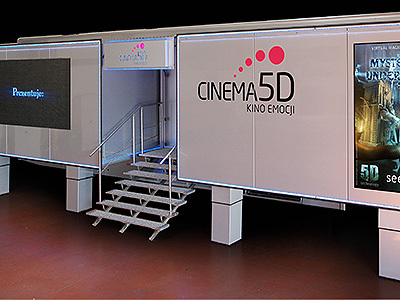 What is more, Mobile 5D Cinema is fully portable so the client can experience a new world in any location! On the outside wall of the cinema there is a LED screen 3×2 meters in size where both film trailers and sponsors adverts can be projected. The Mobile Cinema is placed on a specially designed professional lorry trailer. It consists of two air-conditioned projection rooms, each of which has 16 movable seats. The capacity of the Mobile Cinema ranges from 1100-1600 people during 12 working hours. The trailer is equipped with power generators that produce enough energy to supply the cinema. Thus, we provide entertainment even where there is no access to electricity. In the Mobile 5 D Cinema, the film appeals to all the senses. Spatial music, three-dimensional images, movable seats, leg ticklers, gentle wind, water and various scents give the impression that the viewer is in the middle of the film action!